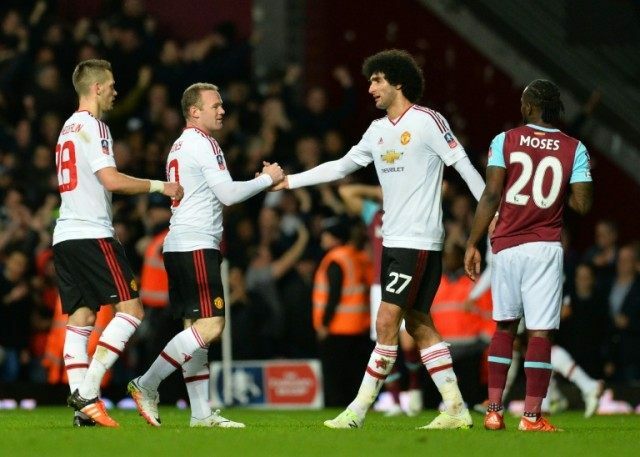 London (AFP) – Teenage sensation Marcus Rashford scored a delicious goal as Manchester United won 2-1 at West Ham United in Wednesday’s FA Cup quarter-final replay to bolster manager Louis van Gaal. West Ham were bidding to crown the final cup tie at their venerable Boleyn Ground home with victory, having pushed United close at Old Trafford in the 1-1 draw when the teams first met. But it was Van Gaal’s United, for whom Wayne Rooney returned to action after two months out with a knee injury, who advanced to a Wembley semi-final against Everton on April 23 courtesy of 18-year-old Rashford’s sixth goal of the season and a close-range Marouane Fellaini effort. Having been under fire for several long months, Van Gaal now has a chance to finish a gruelling season by leading United to a first FA Cup triumph since 2004, which could yet keep him in a job. West Ham, who set up a nerve-jangling last few minutes through James Tomkins’s header, must now seek to ensure that when United return for the last ever game at the Boleyn Ground on May 10, their dreams of Champions League qualification remain intact. West Ham shared six goals with Arsenal in a gripping game on Saturday and they started this match with comparable abandon, Enner Valencia threatening and Dimitri Payet trying to catch David de Gea out with a cunningly disguised free-kick. But West Ham’s eagerness to attack left them exposed at the back, particularly with converted midfielder Michail Antonio and the adventurous Aaron Cresswell at full-back, and as the visitors began to venture forward, they found unexpected space. The quicksilver Rashford had a pair of efforts blocked, while Fellaini, who came in for Morgan Schneiderlin, saw a shot pushed over by West Ham’s cup goalkeeper Darren Randolph. As a heavy rain began to fall, Rashford wriggled away from a posse of defenders and released Jesse Lingard, whose side-foot effort obliged Randolph to save with his legs. Shortly after, West Ham alumnus Michael Carrick volleyed wide. Lingard rattled a stanchion soon after the change of ends and although Cheikhou Kouyate then worked De Gea at the other end, in the 54th minute United’s pressure told. A clearance from Antonio found its way to Anthony Martial, who helped the ball on to Rashford, and the teenager applied further gloss to his gleaming reputation by shimmying inside Tomkins and planting a sumptuous finish in the top-right corner. Not even the most ardent West Ham regular could have complained that the goal was undeserved and with 23 minutes remaining United doubled their advantage. A cross from the right reached Martial at the back post and from his mishit shot, Fellaini steered the ball into the net with his knee from about three yards out. After De Gea had produced a razor-sharp save to thwart Antonio, Tomkins nodded in a knock-down from Andy Carroll with 11 minutes remaining to set up a rousing finale. Rooney made his entrance as a late replacement for Rashford, but he had no opportunity to influence proceedings in West Ham’s half as Slaven Bilic’s side laid siege to the United goal. Carroll headed narrowly over from Cresswell’s cross before De Gea saved twice, from Kouyate and Carroll, and when Kouyate headed the rebound from the latter attempt into the net, to United and Van Gaal’s immense relief the flag went up for offside.